Prevention. An additional layer of authentication is added whenever a critical operation like changing a passphrase is performed. This validation is to ensure that such operations can be performed only by users who have valid Azure credentials. Alerting. An email notification is sent to the subscription admin whenever a critical operation like deleting backup data is performed. This email ensures that the user is notified quickly about such actions. Recovery. Deleted backup data is retained for an additional 14 days from the date of the deletion. This ensures recoverability of the data within a given time period, so there is no data loss even if an attack happens. Also, a greater number of minimum recovery points are maintained to guard against corrupt data. Azure Backup agent. Minimum agent version 2.0.9052. After you have enabled these features, you should upgrade to this agent version to perform critical operations. Azure Backup Server. Minimum Azure Backup agent version 2.0.9052 with Azure Backup Server update 1. System Center Data Protection Manager. Minimum Azure Backup agent version 2.0.9052 with Data Protection Manager 2012 R2 UR12 or Data Protection Manager 2016 UR2. These features are available only for Recovery Services vault. All the newly created Recovery Services vaults have these features enabled by default. For existing Recovery Services vaults, users enable these features by using the steps mentioned in the following section. After the features are enabled, they apply to all the Recovery Services agent computers, Azure Backup Server instances, and Data Protection Manager servers registered with the vault. Enabling this setting is a one-time action, and you cannot disable these features after enabling them. Sign in to the Azure portal by using your Azure credentials. Select Browse, and type Recovery Services. The list of recovery services vaults appears. From this list, select a vault. The selected vault dashboard opens. From the list of items that appears under the vault, under Settings, click Properties. Under Security Settings, click Update. The update link opens the Security Settings blade, which provides a summary of the features and lets you enable them. From the drop-down list Have you configured Azure Multi-Factor Authentication?, select a value to confirm if you have enabled Azure Multi-Factor Authentication. If it is enabled, you are asked to authenticate from another device (for example, a mobile phone) while signing in to the Azure portal. When you perform critical operations in Backup, you have to enter a security PIN, available on the Azure portal. Enabling Azure Multi-Factor Authentication adds a layer of security. Only authorized users with valid Azure credentials, and authenticated from a second device, can access the Azure portal. To save security settings, select Enable and click Save. 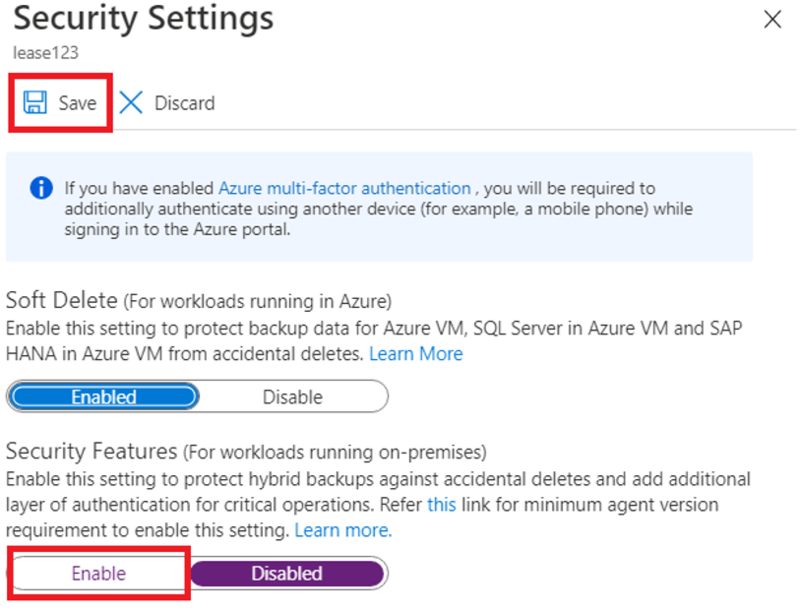 You can select Enable only after you select a value from the Have you configured Azure Multi-Factor Authentication? list in the previous step. If the computer where backups were happening is still available, re-protect the deleted data sources, and use the Recover data to the same machine in Azure Recovery Services, to recover from all the old recovery points. If this computer is not available, use Recover to an alternate machine to use another Azure Recovery Services computer to get this data. If the server where backups were happening is still available, re-protect the deleted data sources, and use the Recover Data feature to recover from all the old recovery points. If this server is not available, use Recover data from another Azure Backup Server to use another Azure Backup Server instance to get this data. If this server is not available, use Add External DPM to use another Data Protection Manager server to get this data. Checks have been added to make sure only valid users can perform various operations. These include adding an extra layer of authentication, and maintaining a minimum retention range for recovery purposes. As part of adding an extra layer of authentication for critical operations, you are prompted to enter a security PIN when you perform Stop Protection with Delete data and Change Passphrase operations. Currently, security pin is not supported for Stop Protection with Delete data for DPM and MABS. Browse to Recovery Services vault > Settings > Properties. Under Security PIN, click Generate. This opens a blade that contains the PIN to be entered in the Azure Recovery Services agent user interface. This PIN is valid for only five minutes, and it gets generated automatically after that period. For daily retention, a minimum of seven days of retention should be done. For weekly retention, a minimum of four weeks of retention should be done. For monthly retention, a minimum of three months of retention should be done. For yearly retention, a minimum of one year of retention should be done. Typically, when a critical operation is performed, the subscription admin is sent an email notification with details about the operation. You can configure additional email recipients for these notifications by using the Azure portal. The security features mentioned in this article provide defense mechanisms against targeted attacks. More importantly, if an attack happens, these features give you the ability to recover your data. This error comes when security settings are enabled, you try to reduce retention range below the minimum values specified above and you are on unsupported version (supported versions are specified in first note of this article). In this case, you should set retention period above the minimum retention period specified (seven days for daily, four weeks for weekly, three weeks for monthly or one year for yearly) to proceed with policy related updates. Optionally, preferred approach would be to update backup agent, Azure Backup Server and/or DPM UR to leverage all the security updates. This error comes when you enter invalid or expired Security PIN while performing critical operation (like change passphrase). To complete the operation, you must enter valid Security PIN. To get the PIN, log in to Azure portal and navigate to Recovery Services vault > Settings > Properties > Generate Security PIN. Use this PIN to change passphrase. This error comes when security settings are enabled, you try to change passphrase and you are on unsupported version (valid versions specified in first note of this article). To change passphrase, you must first update backup agent to minimum version minimum 2.0.9052, Azure Backup server to minimum update 1, and/or DPM to minimum DPM 2012 R2 UR12 or DPM 2016 UR2 (download links below), then enter valid Security PIN. 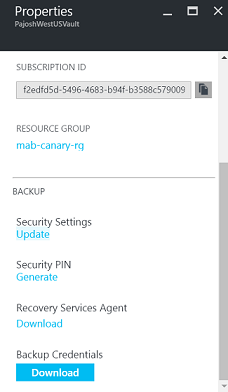 To get the PIN, log in to Azure portal and navigate to Recovery Services vault > Settings > Properties > Generate Security PIN. Use this PIN to change passphrase. 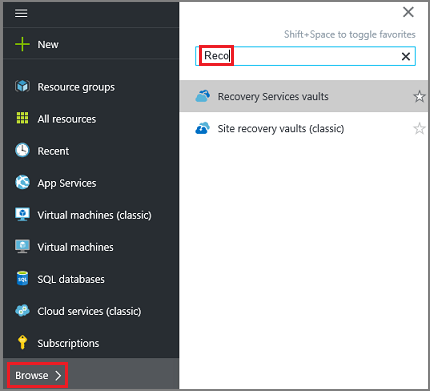 Get started with Azure Recovery Services vault to enable these features. Download the latest Azure Recovery Services agent to help protect Windows computers and guard your backup data against attacks. Download the latest Azure Backup Server to help protect workloads and guard your backup data against attacks. Download UR12 for System Center 2012 R2 Data Protection Manager or download UR2 for System Center 2016 Data Protection Manager to help protect workloads and guard your backup data against attacks.